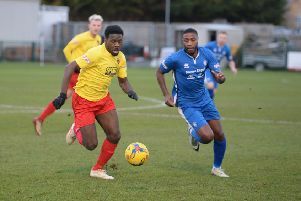 AFC Dunstable returned to the play-off places with a resounding victory at ninth placed Aylesbury United on Saturday. The visitors made the perfect start, taking the lead after just one minute when Nathan Frater and BJ Christie combined for Jermaine Hall to volley home from close range. Hall should had doubled his tally 18 minutes in, when he only had to round the oncoming Ducks keeper Zaki Oualah, but he put his effort wide. AFC continued to press and from a Newman Carney corner, Josh Humbert’s powerful header struck the home sides crossbar. It looked like AFC might rue these missed chances, as Aylesbury nearly drew level on 28 minutes. A fine move resulted in a shot at Garry Malone’s goal but Lea Coulter missed the target. Again AFC were still testing the Ducks backline and when Frater set up Christie, his attempt was blocked and the ball looped over the bar with 11 minutes left in the half. It was 2-0 on 41 minutes though as skipper Leon Cashman released Frater who saw his shot well saved by Oualah only for Cashman to slip the ball home. The Ducks came close to reducing the arrears before half time, when Coulter’s shot struck the upright. Aylesbury changed tactics in the second period and began to go more direct, as they were denied by the woodwork once more though Ollie Hogg. AFC then moved 3-0 ahead on 71 minutes when Newman Carney’s corner eluded everyone and Hall converted his 21st league goal of the season at the far post. Hogg missed again for the hosts as AFC then set about adding some gloss to the scoreline, Christie robbing Jake Bewley on the halfway line and sprinting away to round Oualah for goal number 17 this term. Steve Heath’s men were not finished there either, Courtney Massay smashing in the fifth during added time. AFC are at home to Bedford Town on Saturday. AFC: Malone, Bishop, N Carney, Morgan, Griffiths, Byron, Hall (Massay 80), Cashman (Olaleye 64), Christie, Humbert, Frater (B Carney 84).